"Moab Man" - "Malachite Man"
In 1971 a rockhound named Lin Ottinger was leading a field trip in the Big Indian Copper Mine (more recently called the Keystone Azurite Mine) near Moab, Utah, when he discovered major portions of two human skeletons bearing an interesting greenish color. A bulldozer there had recently removed about 15 feet of overburden, revealing the bones and inadvertently damaging some of them. Within days the find was investigated by archaeologist John Marwitt, who at the time was serving as Field Director for the Utah Statewide Archaeological Survey. Marwitt led the remainder of the excavation, describing the bones as resting in loose, poorly consolidated blowsand, in contrast to the consolidated, hard sandstone further from the bones, comprising the host formation at the site, which is Cretaceous in age. He also indicated that all the bones were unfossilized, that is, not heavily altered or replaced with secondary minerals, and looked essentially modern, other than the greenish staining due to contact with the copper bearing sediments immediately surrounding the bones. Marwitt concluded that the bones were unquestionably intrusive burials, probably only hundreds of years old, and thus unrelated to the age of the Cretaceous rocks around them. Marwitt conveyed his observations to a local reporter from the Times Independent newspaper in Utah, who also came to review the find. Unfortunately, as Marwitt later lamented, apparently the reporter was more interested in a "story" than the truth, and ended up presenting the find as a geologic "mystery" and ignoring much of what he described about it. Left: Color photo from "Malachite Man" web page. Right: black & white photo from Desert Magazine. Both show the original Moab Man find of 1971 and Lin Ottinger, the discoverer. Subsequently strict creationist Clifford Burdick (1973) discussed the finds as likely out-of-place fossils in a CRSQ article, perhaps basing his article mainly on the newspaper account. The find was similarly sensationalized as "mysterious" in a longer story in Desert Magazine (Barnes, 1975), and a brief account in a 1978 book entitled Weird America by Jim Brandon, both of which neglected or misrepresented several aspects of Marwitt's observations. During the mid-1980's Paluxy "man track" enthusiast Carl Baugh purchased one of the skeletons from Lin Ottinger. Baugh subsequently displayed the bones in his little "Creation Evidence Museum" in Glen Rose, Texas, as alleged examples of "out of order" fossils. However, the largely unfossilized condition of the bones from the 1971 finds was personally confirmed by Ron Hastings and myself when we inspected them and visited with Lin Ottinger at his rock shop in Utah in 1988. Although we could not do any invasive work, we found, as others before us had, that the bones were rather were light-weight and largely modern appearing human bones, except for the green staining. Hastings, Kirk Person, and others also inspected the bones Baugh had in his museum around the same time, which appeared largely similar, that is, largely unfossilized. In the late 1980's some of the bones were dated by a UCLA lab, yielding an age of 210 +/- 70 years (Berger and Protsch, 1989). Shortly thereafter Arthur Strahler (1989) published his book Science and Earth History, a chapter of which recounted the Moab Man saga. Later carbon dating tests on more recent excavations from the mine in the early 1990's yielded dates of 1450 +/- 90, with a calibrated one-sigma date range of AD 540 to AD 670, suggesting that the mine had been used by native Americans for at least several hundred years. (Coulam and Schroedl, 1995). However, the dates are consistent with intrusive burials, and contradict claims that the bones were part of the Cretaceous, Dakota Sandstone host rock, which is dated at approximately 100 million years by mainstream geology. Further corroboration of Marwitt's analysis is found in a draft of a book by researchers Eckert and Eckert (1979), who were dismayed by the failure of Burdick and other creationists to depict the Moab Man evidence fairly and accurately. For several years afterward the case seemed to be largely abandoned by most creationists. In late 1997 and 1998 strict creationists Don Patton and David Willis claimed in an internet discussion group led by Jim Moore (which I participated in) that some green bones recently excavated in Utah represented stupendous anti-evolutionary evidence, showing supposed human bones in a Cretaceous deposit. They called the new finds as "Malachite Man" in reference to the green mineral malachite, the presumed source of the green color. However, the web site Willis referred us to, developed by Don Patton and his associate Dave Rudd, showed several photos which turned out to not be from recent excavations, but from the earlier excavations showing Lin Ottinger and the original "Moab Man" bones. A revised version of the web site, located at www.bible.ca/tracks/malachite-man.htm better distinguishes between the 1971 and more recent finds, which did take place in the early 1990's. However, it omits most of the history described above and continues to make a number of unfounded claims about the site and bones, while neglecting mainstream work and writings, and even failing to cite creationist articles on the topic. Patton's web site (which he does not dispute as having been written by him, but which oddy omits his name as the author), states that the bones at the site included at least 10 individuals, including women and children, but provides no specific analysis of the bones to demonstrate how he came to this conclusion. Patton's asserts that the bones under discussion contradict the geologic timetable and demonstrate that humans and dinosaurs lived together. 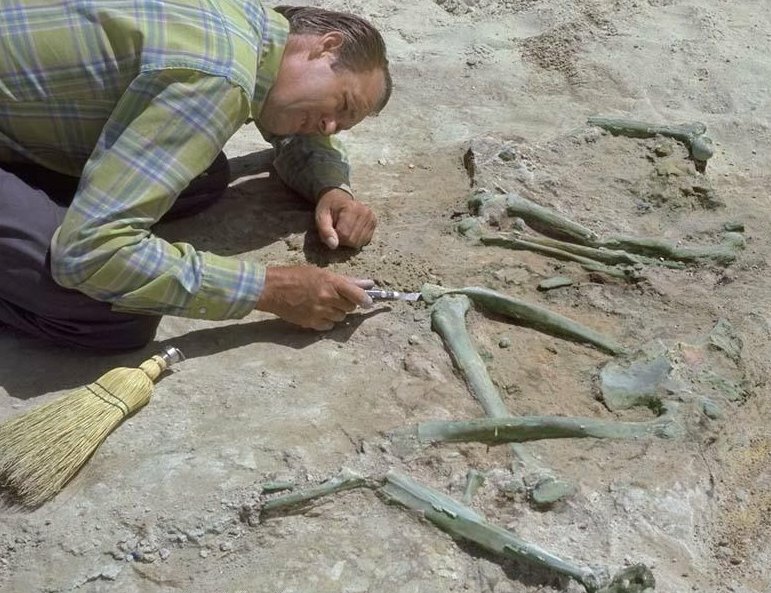 The latter claim he attempts to bolster by stating that the bones are in the same Cretaceous, Dakota sandstone as the dinosaur bones at Dinosaur National Monument. However, the bones at Dinosaur National Monument are not in the Dakota Sandstone, but in the Morrison formation, a Jurassic deposit, approximately 50 million years older than the Dakota Sandstone by conventional dating. Furthermore, since other workers report that the bones at Blue Indian/Keystone Azurite mine indicate that the bones were intrusive burials, the host formation is not particularly relevant to the case, even if it were the same as that at Dinosaur National Monument (which by all evidence, it is not). 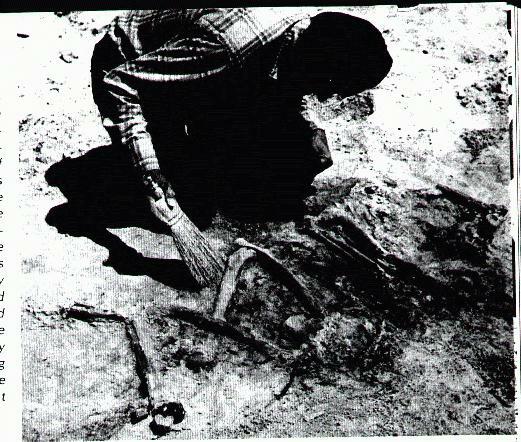 One of the "Moab/Malachite Man" burials excavated in 1990. In the early 1990's additional excavations at the site took place, including some attended by Patton. Patton and some associates initially seemed to suggest that the new finds were significantly different than earlier Moab Man finds, even though the early versions of his web site showed uncaptioned pictures from the earlier digs in association with discussion of recent finds. As mentioned, there were further excavations in the early 1990's, and according to C14 tests, are evidently somewhat older burials. However, as John Marwitt and others indicated, these more recent excavations, which were examined by Julie Howard and other archaeologists from the Bureau of Land Management, appeared very similar to the earlier burials, showing the same type of green-stained, largely unfossilzed bones, in similar burial positions, in the same mining area. More importantly, the bones in the newer finds, like the earlier ones, were reported to be immediately surrounded by poorly compacted, sandy matrix, considerably softer than the hard sandstone of the Dakota formation further from the bones. Thus, although the burials evidently span at least several hundred years, the evidence indicates that all were intrusive, not integral parts of the host formation, or the result of simultaneous burials during Noah's Flood, as Patton implies. Although Patton's revised web site better distinguishes early from recent finds than his initial ones did, he still claims that the bones at the site were found 50 feet below the surface, suggesting this precludes intrusive burial. However, if any of the burials were that deep, clearly not all were. Although ignored on Patton's site, Marwitt and even other creationist authors report that the early finds were about 15 feet, not 50 feet, below the surface. The recent finds evidently represent older burials, and may have been deeper, but based on the other inaccuracies in Patton's account, and the lack of any description of how his measurement was arrived at, it must be taken with a grain of salt. Indeed, a burial along a sloping outcrop could be say, 50 feet from the highest point as measured vertically, but much closer to the nearest exposed surface (along the slope)--the more important measurement in regards to the intrusive burial issue. Moreover, the modern burial depth might not have been identical to the original one, since sediment could have been deposited over the site since the original burial. Thus, without more details and descriptions about how his measurement was made, his comments about burial depth are ambiguous, and at best neglect earlier reports indicating much shallower burial. Patton claims the bulldozer operator testifies that he saw no opening that would allow an intrusive burial. However, any opening would likely have been largely or entirely filled with sediment since the original burial. Further, even if the opening had not been filled, the dozing operation could easily have obliterated or obscured any opening with rubble by the time the operator noticed the bones. Last, and perhaps most significantly, other workers report that they did find evidence of openings leading to burials they examined. Patton also stresses that that some of the bones were articulated, insisting that this requires a global Flood scenario. But obviously graves and other intrusive burials can involve articulated skeletons without requiring a Flood scenario. Moreover, Patton himself acknowledges that some of the bones were not articulated, and other creationists have suggested that disarticulation implies rapid, violent, Flood burial (the opposite of Patton's assertion). Throughout Patton's promotions he failed to mention that a detailed analysis of the skeletons and the history of the various finds at the mine was published by Nancy Coulam and Alan Schroedl in 1995, which supported Marwitt's original interpretation. Although the authors acknowledge some question about whether the bones represent deliberate or accidental burials (either graves or the result of mining accidents), they support the mainstream consensus that the bones represent local inhabitants who became buried in voids in the host formation. They were then covered (whether by nature or humans) with sandy sediment, now recognized as the relatively loose, unconsolidated blowsand immediately around the bones, and different from the Cretaceous sandstone farther removed. After studying all available evidence Coulam and Schroedl write, "After visiting the mine in 1995, we "We believe the human remains from the Keystone Azurite Mine are the remains of ancestral Puebloan miners who were either deliberately or were accidentally buried while mining for Azurite in the 6th or 7th century A.D.
Patton still insists the bones were an integral part of the sandstone rock, but this contradicts the observations of virtually all other excavators at the site. It also seems inconsistent with his own comment that he excavated some of the bones in a matter of days. Bones encased in hard rock typically require much more effort and time to extricate. Patton's web site emphasizes the deep green color of the bones as if this too supported his case. However, fossilized animal bones from the Dakota formation do not resemble the Malachite Man bones in color or composition (Eaton et al, 1997). Instead Dakota formation bones are typically brownish hues and are heavily replaced with secondary minerals, that is, well "fossilized." Jim Kirkland, who has extensively studied Dakota fossils, says that he has never seen in situ bones in that formation that closely resemble the "Malachite Man" finds (Kirkland, 1998). Thus, instead of supporting his claims, comparisons and contrasts of the MM bones with genuine Mesozoic bones only further undermine Patton's claims. Patton's web site claims that a lower jaw bone, seen in a photograph at his web site, contains teeth composed entirely of turquoise. However, the site does not describe how he determined this. Even if it were true, it is unclear how it would support his basic contentions that the burials were non-intrusive and resulted from Noah's Flood. When Scott Hurst asked Patton at a MIOS* meeting in November of 2002 how he had determined the composition of the teeth, Patton reportedly replied that he could tell from looking and scraping one that the teeth were all turquoise. Obviously, however, a scrape would only determine the composition of a tooth to the depth of the scrape. Moreover, it is unlikely that teeth would be totally replaced with a foreign mineral, considering that the bones were largely unfossilized. Patton's web site also fails to reveal that his Moab/Malachite Man claims not only have been rejected by mainstream workers, they have not been well accepted even within creationist circles. Indeed, as far as I know, no major creationist group has supported them, and some creationist authors have specifically questioned Patton's claims. For example, in his book Fossil Facts and Fantasies creationist Taylor suggests the bones might have been buried by Noah's Flood, but acknowleges, "there are also reasons to suspect that it was a cave-in on a group of miners" (Taylor, 1999). Another creationist author, Mark Armitage concedes that there is "general consensus that these remains are unfossilized and that they represent an intrusive aspect to the Dakota Sandstone (Cretaceous) rock where they were found, and are not humans buried in situ. Incidentally, as evidence that Armitage considers the Moab Man and Malachite Man bones to be largely similar in all important respects, Armitage states, " specimens of "Moab man" (a.k.a Malachite Man) hipbone were received from Mr. Joe Taylor (Taylor, 1999, p. 62)." According to pastor Scott Hurst, who attended a MIOS meeting on 11-4-2002 at which Patton gave a talk on these finds, Patton explained that he renamed the finds "Malachite Man" because the original man did not have the right to the name "Moab Man." It's hard to say what he meant by this, or how Patton has any more right to name the find. 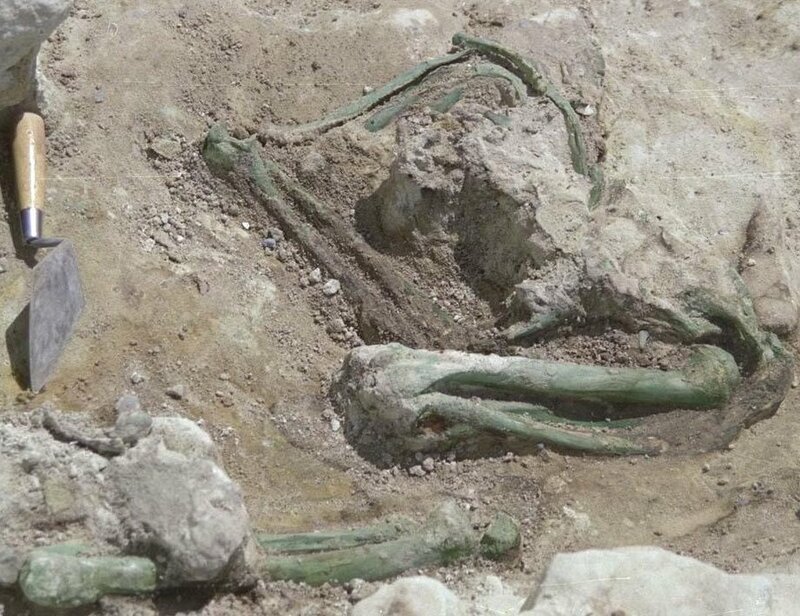 Interestingly, the CRSQ article by Armitage stated that the bones were renamed "Malachite Man" by Joe Taylor, "due to the bright green patina they display." At any rate, evidently the name Moab Man developed informally soon after the early finds and was a convenient way to refer to them; coining a new name seems only invite confusion as to whether the old and new finds were from the same quarry and geologic context, which evidently they are--albeit with multiple individual burials and excavation dates. The Moab Man/Malachite Man bones represent a number of intrusive burials in the Dakota Sandstone, and are not integral parts of the host formation. The bones evidently represent intentional or accidental entombments of native Americans in a mining environment. As reported by a number of conventional workers and even some creationist authors, the bones are largely unfossilized and of essentially modern appearance, except for the greenish stain. There is no foundation for the claims of a few creationists that the bones contradict mainstream geology or support dinosaur/human cohabitation. * MIOS stands for "Metroplex Institute of Origins Science," a strict creationist organization that meets near Dallas, Texas. Armitage, Mark. 2001. Scanning Electron Microscope Study of Mummified Collagen Fibers in Fossil Tyrannosaurus rex Bone. Creation Research Society Quarterly (September 2001). Vol. 38, No. 2. pp. 61-66. Barnes, F. A. 1975. The Case of the Bones in Stone. Desert Magazine (Feb. 1975). p. 36-39. Berger, R. and R. Protsch, 1989. UCLA Radiocarbon Dates XI. Radiology. Vol. 31, No. 1. pp. 55-67. Burdick, Clifford, 1973. Discovery of Human Skeletons in Cretaceous Formation. Creation Research Society Quarterly. Vol. 10, pp. 109-110. Eaton, J. G., Kirkland, J, I., Hutchinson, J. H., Denton, R, O'Neill, R.C., Parris, J. M. 1997, Nonmarine extinction across the Conomanian-Turonian oundary, Southwest Utah: Geological Society of America Bulletin, Vol. 109 No. 5, pp. 560-567. Eckert, A. W. and N. D. Eckert. (c. 1979). Introductory chapter to The Encyclopedia of Unexplained Phenomena (draft). Hastings, R. J. 1995. "A Tale of Two Teeth." Creation/Evolution. Issue 36, Vol. 15, No. 1, pp. 1-14. Kirkland, Jim, email communication, Feb. 23, 1998. Kuban, G. 1989. Sea-monster or Shark? Reports of the National Center for Science Education. Vol. 17, No. 3. pp. 16-28. Strahler, A. 1989. Science and Earth History. Prometheus Books. pp. 470-471. Taylor, Joe. 1999. Fossil Facts and Fantasies. Blanco Publishing Co., Mt.Crosbyton, TX. "The burials are completely modern type and were obviously intrusive into the deposits in which they were found, but evidently the [Times Independent] reporter in question was looking for a story, not the truth." "...Burdick's account of the human skeletons found near Moab is not strictly true. The burials had apparently been placed in the rock crevice (a common practice historically and prehistorically) and fell to the bottom. Blasting and bulldozing later removed the overburden and exposed the burials. I took some pains to point to all concerned, including the "Creation Research Society," that in no sense could the human remains be seen as contemporary with the sandstone deposit. The burials were surrounded with and covered with loose blowsand; they were not in a rock matrix as implied by Burdick. The bones themselves were not fossilized and there had been no replacement of the bone calcium by mineralization. They were soft, friable, and partly decayed--in short, of rather recent vintage, probably Paiute or Ute." - Letter from Marwitt to Dr. Duane E. Jeffery, Department of Zoology, Brigham Young University, 11-27-73. A prevailing opinion among the writers of books dealing with unexplained phenomena is "Why are the scientists hiding things from the people? Why don't they investigate things with an open mind? "Why do they refuse to cooperate whenever something occurs that doesn't fit into all their highly-revered theories..."
Unfortunately, in far too many cases, those who are crying their laments loudest are those least interested in accepting the truth. They accuse the scientists of ignoring the evidence but then, when the answers are provided, it is the laminators who ignore the scientists and what they have to say. A representative case in point turned up in the process of research for this book. The authors had encountered tantalizing tidbits of information suggesting that human bones had been found in matrix semi-rock, in situ, in southeastern Utah. These bones were alleged to be in Mesozoic Era rocks of the Cretaceous Period and over 100 million years old. That is far older than the oldest human remains, by many millions of years and, if valid, would revolutionize existing theories about man's appearance on earth. The discovery had occurred about 35 miles southeast of Moab, Utah in a remote desert valley. "...we set about trying to locate the anthropologist who figured so prominently in the case, John P. Marwitt...we wrote to him, explaining the nature of our book and its research in general and how it specifically concerned John Marwitt. "Enclosed here you will find a copy of a one-page description of the occurrence and subsequent happenings. Would you please look it over an tell me whether or not the reporting is accurate. Unfortunately the reporter seems to have been unduly harsh in his commentary and it strikes us that there must be more than meets the eye here...."
"In reply to your letter of July 27 regarding the Moab skeletons, I am enclosing copies of some of my correspondence in an effort to disabuse you of the notion that this find was the 'momentous anthropological discovery' claimed by Brandon. What we have here is a manufactured mystery which has survived to the present only because a few journalists are more interested in peddling sensation than in telling the truth...I hope that you will set the record straight. To this end, even though the enclosed correspondence answers most of your questions, I will reply in detail below. [Marwitt wrote even more than is recorded here; I will gladly send anyone a copy of the actually chapter draft upon request]. Q: Were the bones first located by Lin Ottinger and later excavated by you actually Homo sapiens? A: Yes, the bones were H. sapiens, as claimed. Q: What was the rock or semi-rock material in which these bones were discovered. Q: Were the bones actually found in situ? "I again emphasize that the bones were not associated with or included in any rock formation, but with loose blowsand and sandstone spalls representing the fill of a crevice of some kind." Q: When the bones were packed up and taken to the University of Utah, what did the subsequent examination there show? A: Examination at the University confirmed my field interpretation to the effect that the bones were H. sapiens, that they were not fossilized, and were essentially recent." Q: If in actuality the bones are an anomaly in anthropology, how has this affected the scientific community and what are the conclusions drawn? A: There is no scientific anomaly at all, and those members of the 'scientific community' who (sic) I have informed of the Moab finds have reacted with amusement and mild disgust to the antics of those irresponsible journalists who manufactured and perpetuated the hoax. "I am very happy that unlike Brandon and others who have written about the Moab finds, you took the trouble to contact me before publication. I trust that your forthcoming book will give the reading public the true story and thereby dispose of the supposed mystery. Should you have further questions, feel free to contact me at your convenience..."
As authors of The Encyclopedia of Unexplained Phenomena, we must add that we feel Dr. Marwitt's irritation at irresponsible journalism is wholly justified. Acknowledgments: I want to thank those who have been helpful in gathering data on this case, especially John Marwitt, Ronnie Hastings, Jim Foley, and Jim Moore.